Exactly two years ago, on December 18, 2010, Swedish altoist Martin Küchen recorded "Hellstorm", in an audienceless church in Sweden. The result is so excellent that two reviewers were competing to give their opinion. 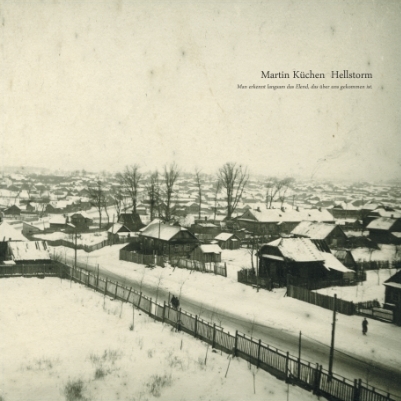 "Hellstorm - Man erkennt langsam das Elend, dass über uns gekommen ist" is a quote from saxophonist Martin Küchen's father's diary, written at the end of the Second World War. It means "the misery that has fallen upon us, is slowly being recognised". Küchen's passion and compassion and rage with the ways of humanity are known and mentioned in the reviews with Trespass Trio and Angles. Now he does it alone, using multiple instruments : baritone saxophone, radio, alto saxophone, electronic tampoura and even electric toothbrush, assisted by Jakob Riis who mixed and mastered. Simple tools to rage against war, but his cry is a powerful one. The music was recorded live in Allhelgonakyrkan, the All Saints Church in Lund, Sweden, on the 18th of December, 2010. Not that this is a live setting or so. They just went into the church on a snowy day two years ago and recorded the music in one take. Then they left. The end result is one of those rare records that make you weep with sadness. It is beautiful in its simplicity, in the cry of the single voice, sometimes quenched, often howling, yet melodiously, lyrically, using every possible timbral possibility to make the feelings richer and truer, as a real human voice would. The incredible sadness that permeates the whole album is relatively unique, including the abandon with which Küchen is willing to expose his own feelings in what some might call brutally sentimental. I have tried to find comparable voices, but I get no further than Frank London's "Invocations" or Lou Reed's "Berlin", but the former is more spiritual and the second more personal, yet the common denominator is the infinite sadness and powerlessness of the individual. The kind of sadness that makes you uncomfortable, but because of the music's aesthetic beauty, you want to hear again, yet I can also guarantee that when you feel sad, it will give you comfort. This is no longer experimental music. This is the voice of an artist who knows how to go beyond the surface of technique to dig deep, and finds a language that everybody will understand. To Küchen's credit, he always stays on the right side of good taste, which is the biggest challenge when going this far into emotional expressivity, and even more, he creates sounds you've never heard before, yet the underlying feeling is all the more familiar. There have always been albums that discuss free music and Nazi atrocities - like John Zorn’s Kristallnacht or even recently Günter “Baby” Sommer’s Songs for Kommeno and Martin Küchen’s other new album Brother Beda. But while Sommer’s well-intentioned lament fails because it is too pompous, Küchen’s approach is much more private and subtle. This is already shown in the fact that it is a solo album with him on baritone saxophone, radio, alto saxophone, electronic tampoura, and electric toothbrush. Hellstrom tries to transcend the results of Nazi terror starting with “Allemagne Anneé Zero”, a reminiscence of the Roberto Rosselini film of the same title which was shot in a bombed Berlin in 1948. Supported by electric tempura and radio static Küchen’s high-pitched baritone literally cries out the whole grief people must have felt, you can see hollow-eyed people walking like ghosts through the ruins. All that was left was complete nothingness … devastation … disaster … hell. It is simple music, recorded in one take in a Swedish church on a cold winter’s day. Hardly ever has there been so much sorrow and immediacy in music. But Küchen wants to show terror in context, he gives suffering a sound. The next track, "The Russia We Lost", refers to a documentary which shows “the horrendous, hyper- destructive long period of Bolschevism” as Küchen says in the liner notes. Again, now with Küchen on solo baritone, the music is of tangible sadness, but although it is full of emotion you can feel the chill of the Russian winter creeping through your bones. Küchen hardly cannot stand the fact that children are slaughtered, that people are losing their homes, starving, being killed by missiles all over the world. “Sarajevo” just reminds us of the latest tragedy right in front of our door when more than 10,000 people were killed and large parts of the city were destroyed. It is music that shows history from a people’s view (here especially the Bosnian people when he uses Arabian elements as key motives in the track). “10,000 Years” and “Ritual Defamation (to Laird Wilcox)” are like one song. Now the atmosphere is changing, the tracks are more percussive and Küchen uses circular breathing. It is hard to bear these last two pieces because it seems that you can hear the piercing shrieks of dying people. Even if this review sounds completely depressing I highly want to recommend this album. I cannot recall when I heard music so moving. However, there is comfort in the way Küchen tries to fight his personal ghosts. He looks on the ruins as if he was contemplating his own broken history (he has Jewish ancestors who died in Auschwitz). And although we slowly recognize this huge misery that has come upon us (this is what the German part of the title means) we try to fight and keep going. Even if this seems to be a truism, it gives this album a deep humaneness. Hellstorm is available as a limited vinyl edition (but also as a digital download). If you have a record player, I can only recommend the LP, it sounds beautiful.